Pecknold walks us through his latest video, “The Shrine/An Argument,” which draws on an animation technique from the 1970s. The hallmark of Sean Pecknold‘s work is a painstakingly handmade quality that results in wonderfully atmospheric and surprisingly poignant films. He first came to critical prominence with his woodsy stop-motion video for “White Winter Hymnal” by Fleet Foxes (his brother is the lead singer). He’s since directed more abstract pieces for that band, as well as clips for buzz bands Beach House and Grizzly Bear. 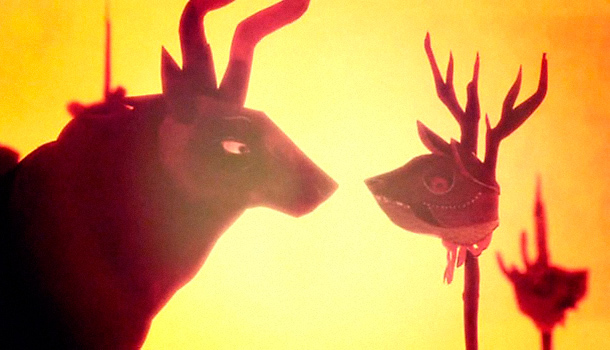 Here, Pecknold discusses the inspiration and process for this mystical journey–the story of a lonesome elk that journeys through a gruesome world before undergoing a radical transformation at the hand of a double-headed sea monster–that involves dancing gods, laser-shooting owls, and warring sea monsters. Please describe what’s happening in this video. A relationship between an elk and his rider has reached its death, and so he is left to wander alone through a lonely and turbulent universe towards his fateful end. Oh, and an owl shoots eye-lasers into the elk at one point. What influences did you draw on for the concept or the aesthetic? Well, the characters were inspired and created by the lovely Stacey Rozich, whose work is just amazing. When I first saw them I immediately wanted to see them move; they have an inherent tension and movement to them that was begging to come to life. As far as other influences on the story and style, I’m always drawn to older animation from the ’60s and ’70s, in particular for this one the ’70s Italian animation Allegro Non Troppo. It’s incredible. Aside from that, I was mainly inspired by the song itself. It has a dark narrative to it that inspired the story that I attached to it. What’s the origin of the characters? The characters specific to this story originated inside my brain one night as I was typing the script to show the band and then give to Stacey. I really listened hard to each part of the song and tried to imagine what sort of character(s) would live there. For example, I thought of the five dancing gods as I listened to the drums in that section and imagined them standing around a fire stomping along to the beat. The very first image I had for this video was two hungry sea beasts desperately fighting over a fallen hero. And they had to be loose and wild, because that part of the song is so fun and unexpected. The rest of the characters came in as I fleshed out the story. Well, my favorite scene to animate and the scene think I enjoy the most is the ending argument. The sea creatures were such fun puppets, and animating directly to the freak-out was so much fun. I almost hit rock bottom after animating up until that scene, but those puppets brought me back to life. I also like the scene when the elk rips the head off the little creature in the house. There is something lonely and revealing about the elk in that scene. What’s involved in making something like this–how long did it take? Robin and I approached Stacey in January of this year. And then I wrote the script and Stacey illustrated some of the characters in March. In April we moved into a new studio in Portland and started working on the puppets construction and painting the set pieces. Animation started in May, and continued through the summer all the way until early October. For most of the summer it was me, Britta Johsnon, and Natalie Jenkins working really long days for a really long time. Britta Johnson was just a hero on this project, and she animated the moving hair on the gods that is a unique part of Stacey’s illustrations. That was one of the hardest things to animate. Recovering. I just finished another short film for Dragonframe (www.dragonframe.com), the company that makes the awesome software that I use. I’ve also been traveling for a design and photography project. I’m also starting to develop a feature-length narrative piece. Because I like things that take a really long time, I guess.